Our first full day in France and we followed through with our plan to rest and relax before we got too enthusiastic about doing all kinds of things. We slept in and then made a light breakfast with a few things we had purchased after settling in and recovering the previous evening. Then we discovered our local boulangerie — only a few steps away from our apartment (yes!!) What am amazing array of pastries and breads for much less than US prices. Our pain du jour cost the equivalent of $1. I’m going back tomorrow for that scrumptious-looking apricot pastry I saw. 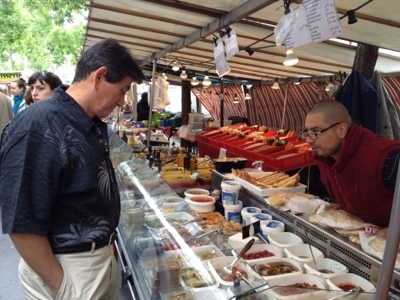 Next stop — a neighborhood Sunday farmer’s market where all the locals stock up for the week as did we with delectable meats and cheese plus many fresh fruits and vegetables for our evening repast. We were definitely the only American’s there and Norman did an impressive job with his French. However, Sunday is typically a day of rest for the French. Many businesses, restaurants, and markets are closed. We had one pressing need on our shopping list — toilet paper — for all our apartment’s amenities this particular item was minimally provided. In the end, we had to settle for purchasing it at a tiny minimart. Located on the Left Bank, our neighborhood is the 14th Arrondissement better known as Montparnasse. This is where you will find the Tour Montparnasse (the famous Parisian skyscraper), the Gare Montparnasse (train station), the Cité Internationale Universitaire de Paris (university) and the Stade Charléty (sports stadium). 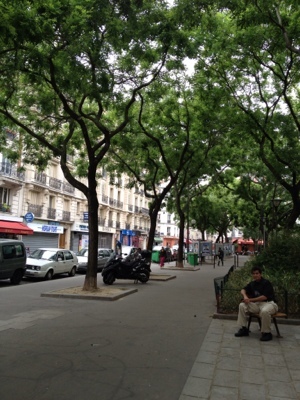 Montparnasse is also known as an artist community and is home to a variety of small museums and galleries. This is where many famous artists and intellectuals like Simone de Beauvoir, Jean-Paul Sartre, Max Ernst and Pablo Picasso lived and spent their days.